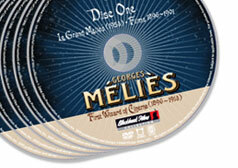 It’s been a while since we added anything new to the Bioscope Library. 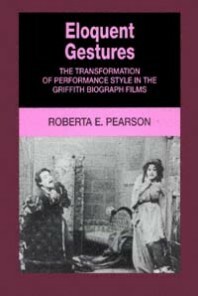 A new wing has been added to the tottering edifice that is Bioscope Towers, and first on the fresh new set of shelves therein is Roberta E. Pearson’s Eloquent Gestures: The Transformation of Performance Style in the Griffith Biograph Films, published by the University of California Press in 1992. This is one of the titles that the enlightened UCP has made available for free online as one of its eScholarship Editions offerings. It is a model ebook presentation, as well as being one of the most interesting and stimulating books written on the films of David Wark Griffith. The book’s subject is the changes in the style of the actors’ performances in the films of D.W. Griffith, particularly between 1909 and 1912. Pearson sets this up in a delightful introduction in which she imagines Josiah Evans, “a man with a civic conscience who belongs to several progressive reform organizations”, attending a Broadway storefront picture show in 1909 in which he sees a film entitled The Drunkard’s Reformation, which he rather enjoys because it reminds him of the blood-and-thunder stage melodramas of his youth. The acting of the young wife as she depicts her misery and desperation particularly affects him. She collapses into her chair and rests her head on her arms, which are extended straight out in front of her on the table. Then, in an agony of despair, she sinks to her knees and prays, her arms fully extended upward at about a forty-five degree angle. … but this moving picture does not remind him of the blood-and-thunder melodramas of his youth. The acting is the equal of Mr. Gillette’s in Sherlock Holmes or even of that in the Belasco play he and Lydia had attended last night. Particularly impressive is the young wife’s despairing reaction to her husband’s harsh treatment and abandonment. After he leaves for the saloon, the wife walks back to the dining-room table covered with the debris of their evening meal. She sits down, bows her head, and begins to collect the dishes. She looks up, compresses her lips, pauses, then begins to gather the dishes once again. Once more she pauses, raises her hand to her mouth, glances down to her side, and slumps a little in her chair. Slumping a little more, she begins to cry. How differently this actress portrays her grief from her counterpart in A Drunkard’s Reformation. A lot has changed in those three-and-a-half years since his first visit to a nickelodeon. How the films of D.W. Griffith moved on from the one style to the next is the subject of Pearson’s book. It traces in meticulous detail the transformation from an acting style inherited from the stage meodramas of an earlier era, to a nuanced style that benefitted from ‘realist’ developments in literature and theatre. It wasn’t there in 1909; it was there in 1912, and by examining closely the films made in that intervening period and being attuned to contemporary cultural developments, the path from the one to the other can be drawn. This is what Pearson does. The study of cinematic performance demands that we not depend upon our own aesthetic judgments, which we tacitly deem eternal and unchanging. Rather, we must acknowledge history by attempting to understand the aesthetic standards of another time and place, of a culture very different from our own. The rest you must read for yourselves, and I warmly recommend that you do so. Though this is very much a thesis turned into a book, with all of the formal argument structures that one recognises (such as having an introduction which rubbishes the opposition), it illuminates understanding – not just of Biograph films, but of any cultural artefact from any period which we may be tempted to interpret from our personal aesthetic experience but which needs to be seen, first and foremost, as the product of its own times. The ebook presentation is excellent. The book is divided up into hyperlinked chapters, and page breaks are indicated where they occur in the original, which is good for accurate citation. Notes in the text are hyperlinked to a notes section at the end, the index has hyperlinks so you can go directly from term back to the text, and the illustrations are available in small and full size versions. Finally there is a search box enabling to search the entire text of the book. Excellent all round. Into the Bioscope Library it goes.